Never let it be said that we can’t beat a horse to a delicious delicious death. When we go Mexican(ish) we take it all the way. In a small saucepan combined the sugar and water. Bring to a simmer and stir until the sugar is dissolved. Remove from the heat and add the basil, mint, cinnamon stick, orange and lemon zests, and stir to combine. Allow to cool to room temperature, stirring occasionally – about 20-30 minutes. Strain. 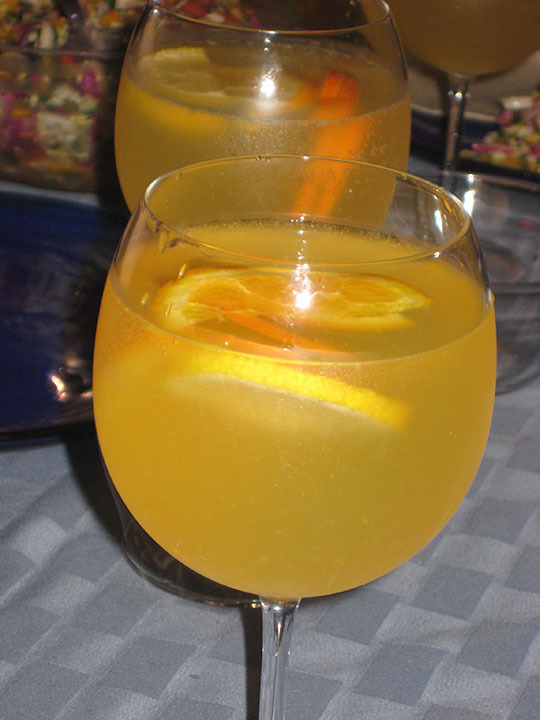 Combine the brandy and orange juice, and strained sugar syrup. Can be made in advance & refrigerated. In a large pitcher combine the brandy mixture, wine, sliced citrus, frozen blueberries, and some additional decorative springs of basil if you desire. Stir to combine. 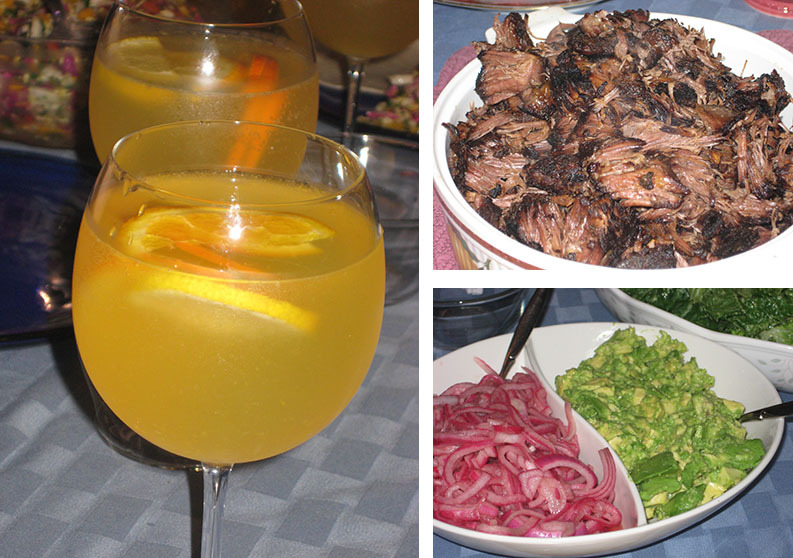 Serve – allow people to add soda water to the glasses if desired. In a large casserole pan arrange the chilis, onion, celery, carrots, garlic, bay leaves, and cinnamon stick. Mix together the kosher salt, dried oregano and cumin. Trim any egregious fat deposits from the short ribs (boneless short ribs tend to be fairly well trimmed already, which is convenient), and then toss with the salt mixture. Arrange the short ribs over the vegetables in the pan. Pour the water over everything, and then tightly cover the pan with a double layer of foil and braise in the oven for 3 ½ hours, until the meat is very tender. Carefully transfer the short ribs to a different oven safe pan and allow to cool (the meat will be super tender, so carefully is the watch word here). Cover and refrigerate. Remove the bay leaves and cinnamon stick from the vegetable mixture. Then strain out the vegetables from the liquid – pressing on them to extract as much liquid as possible. Refrigerate the vegetables and the liquid separately. The next day lift off the layer of fat that has risen to the top of the liquid and solidified (this is why you refrigerate the vegetable and liquid separately). Puree the liquid and vegetables until very smooth. Season to taste with salt/pepper/honey/orange juice (or vinegar). Reheat slightly in a saucepan. Spoon about ½ cup of the sauce over the cooked short ribs, cover tightly, and reheat in a low oven for about 30 minutes. Heat a grill pan and oil generously. 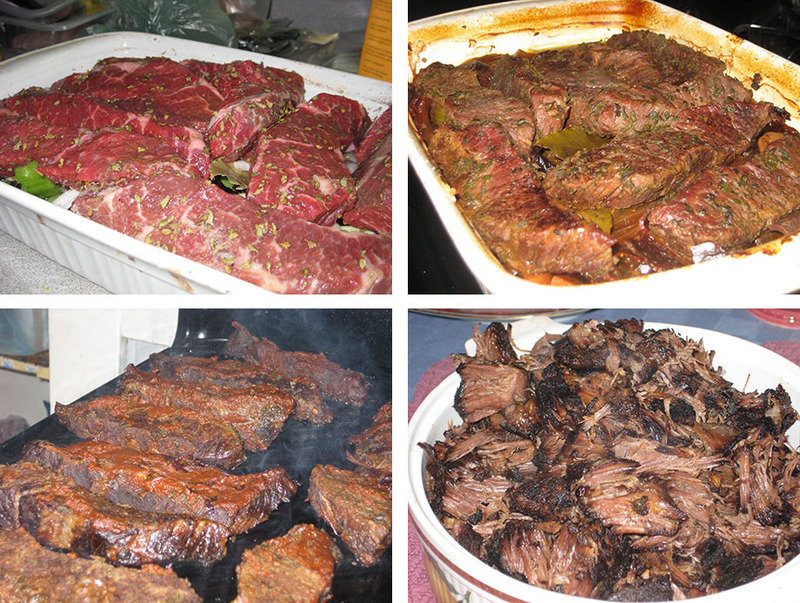 Grill the reheated short ribs until browned/charred on all sides, transfer to a cutting board and shred with forks. Mix with the liquid/sauce from the reheating process. Serve with the extra sauce on the side (plus any and/or all of the other fixings listed above). Puree the tomatillos, basil, jalapeno, and garlic until smooth. Season to taste with salt/pepper/lemon juice/honey. Can be made up to 3 days in advance and refrigerated. I omitted the pistachios, and seasoned with cumin & coriander to meet the theme. Puree all together until smooth. Season to taste with salt/pepper. Hull the strawberries, and then use a small spoon/melon baller to scoop out the interior. Take a small slice off the tip of the strawberry so it will stand upright. Mix the jello with ¾ cup boiling water, stirring until the jello is completely dissolved. Add the tequila and Cointreau. Pour the jello mixture into the strawberry cups – filling them as full as possible because jello shrinks as it cools. Chill for at least 4 hours. Mix together lime zest and sugar on a plate. 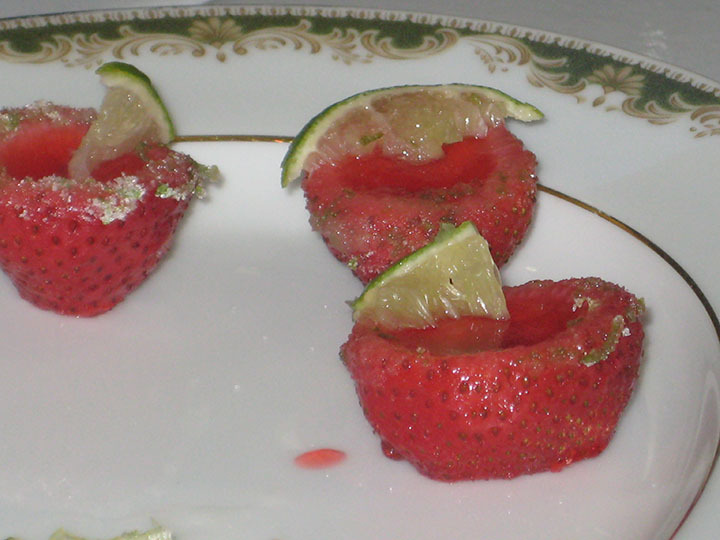 Wet the rims of the strawberry jello shots with a little water and then roll in the sugar-lime zest. Garnish with a thin sliver of lime. Birthday girl wanted to bring her own dessert, and since she was making dulce de leche from scratch I didn’t argue particularly strenuously.